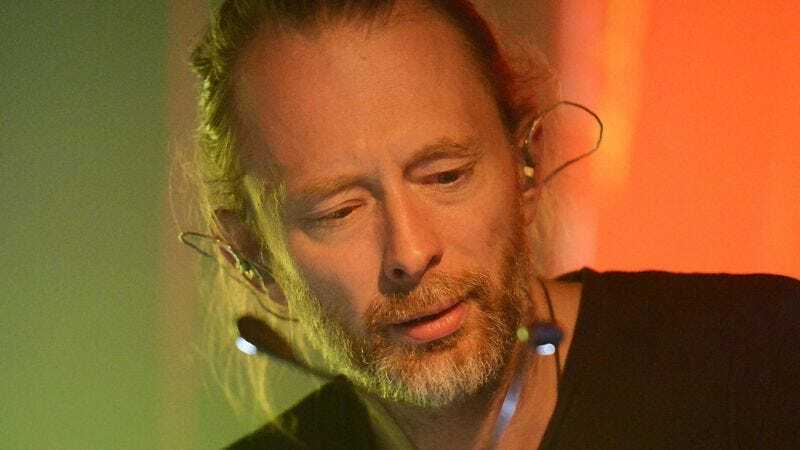 A collective shudder just ran through every publicist from London to Sydney as Radiohead frontman Thom Yorke, in a brazen act of defiance, just violated one of public relations’ most sacred commandments: Whatever You Do, Don’t Mention The Nazis. People continue to say that this is an era where music is free, cinema is free. It’s not true. The creators of services make money–Google, YouTube. A huge amount of money, by trawling, like in the sea–they take everything there is. ‘Oh, sorry, was that yours? Now it’s ours. No, no, we’re joking–it’s still yours’. They’ve seized control of it—it’s like what the Nazis did during the second world war. Actually, it’s like what everyone was doing during the war, even the English—stealing the art of other countries. What difference is there? And to be fair, Google probably could round up most of the world’s population into prison camps at this point, as long as those camps had free, decently fast wi-fi. And artists do get paid a laughably small percentage of the money generated by streaming services, which would not exist without the musicians they routinely screw over. But by Yorke’s logic, if the streaming services are the Nazis, does that make Taylor Swift and Adele leaders of the resistance? If you’re going to make such sweeping metaphors, Thom, you really ought to think them through. For the publicists’ sake.